We lost Lemmy (Ian Kilmister) of Motorhead over the Christmas break, but advances in science have presented the perfect opportunity to honour his memory. The discovery of four new super-heavy chemical elements was announced this week, the first to be added since 2011. 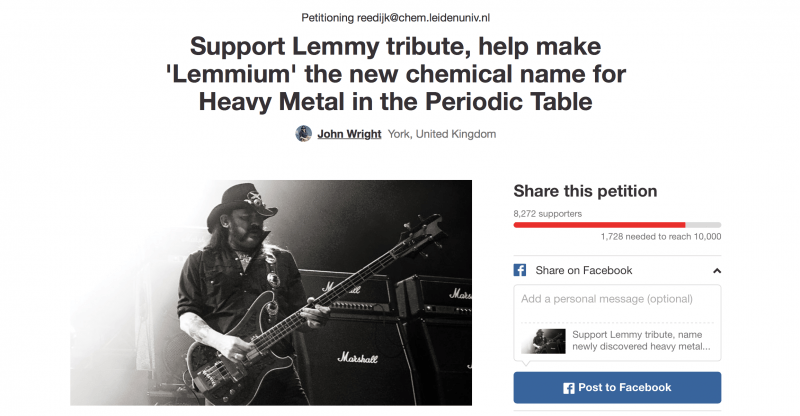 In response, John Wright of York has created an internet petition on Change.org to have one of the new super-heavy metals named to Lemmium. The petition is unlikely to be successful due to the stringent rules surrounding the naming of elements, which are to be named after a place or country, mythological concept, a property, a scientist, or a mineral. One could argue Lemmy qualifies as mythological concept, but that’s an uphill battle. There’s also the problem that Lemmy believed Motorhead to be a rock-and-roll outfit, not a heavy metal group. Would signing this petition honour his memory, or aggravate him by associating his music with a genre Lemmy didn’t believe he was part of? The petition is seeking 10,000 signatures to start, and has surpassed 8,000. You can support this vital movement by signing the petition here.